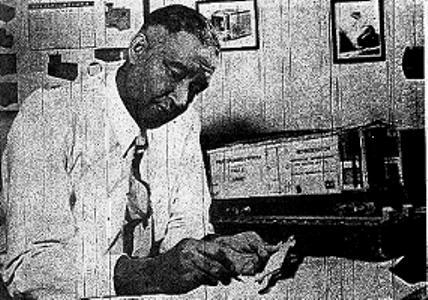 Frederick McKinley Jones is undisputably one of the most important African American inventors ever, holding more than 60 patents in a variety of fields before his death in 1961. Mr. Jones was born in Covington, Kentucky, but he made Hallock, Minnesota his home as an adult. Winters were hard in Hallock and the snowstorms were overwhelming. 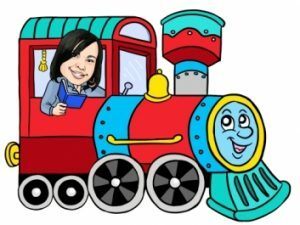 Because Mr. Jones was so good with maintaining automobiles, Hallock physicians often asked him to drive their calls for them as they made their house calls. One day in 1919 after a particularly bad snowstorm, Mr. Jones got the idea to build a snowmobile for faster, easier traveling. This photograph shows Jones seated in his snowmobile alongside two passenters. Jones built the machine by using a discarded airplane body and attaching two ski-like runners onto the front and back. He attached a propeller and engine on the back, and placed an old car seat over the gas tank. Then he chose bicycle handlebars to steer the runners. This first snow machine had no brakes, and when Fred wanted to stop, he stuck his feet out on each side and let them drag in the snow. Mr. Jones’ snowmobile was innovative, but unfortunately, he didn’t patent it. He just pondered on ways to make it better. 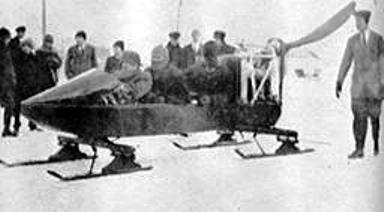 Years later, another man went on record as inventor of the first snowmobile. Today, snowmobiles are used for snow travel all over the world. By the way, Mr. Jones is so amazingly brilliant, there is no possible way to bring you all his inventions in this one modest post. Stay tuned for more on Mr. Frederick McKinley Jones. Next articleJoseph Lee…Baking up a Storm!